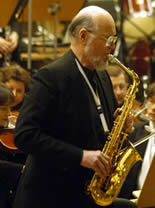 official home of saxophone artist performer and educator Fred Hemke. The premiere performance of Augusta Read Thomas' Hemke Concerto: Prisms of Light was a huge success! Dr. Frederick L. Hemke's performance was nonpareil and the collaboration between Maestro William Boughton and the New Haven Symphony Orchestra was simpatico. I do not believe I have ever heard Dr. Hemke sound better! It was a great privilege to attend the concert and join the large contingent of alumni, family and friends who came to Connecticut to attend the festivities. I would like to thank, once again, everyone who helped make this project come to life. Fred worked tirelessly in consultation with Gusty on the composition. Also, he practiced intensely to put together an incredible realization of the piece. Marjorie Shansky's legal guidance (as well as her fantastic flute playing in the New Haven Symphony Orchestra!) were indispensable to the process of making the finances and the contract work for us. Denise Meyer's organizational skills and hospitality helped make the week's activities a joy for everyone who came to New Haven. William Street kicked our fund raising into high gear last year. He made the difference when he joined our team. Jonathan Helton was the webmaster who made it possible for us to communicate. Susan Nourse and Gail Levinsky, who organized the Hemke Reunion in 2011, set the project in motion through the energy, enthusiasm and organizational flair they brought to the Reunion. Finally, everyone who donated to the commission made the project possible. Those contributions, large and small alike, delivered the triumph we witnessed in New Haven last week. I am pleased to report that the compact disc recording is scheduled for a June, 2014 release date! As soon as the recordings and the scores are made available to us, we will mail them to commission donors. Thank you for helping us to share Fred's legacy! These special arrangements by Jonah Blum for saxophone and string quintet or saxophone and piano are available from EnF Productions. All Hemke CDs available for sale at the STORE on this website. Over the past sixty years, I have been intimately involved with saxophone pedagogy and the performance of music written for our instrument. During the past 50 of these years, I have taught many wonderful students at Northwestern University and have had the pleasure, through their teaching and performing,to see the stature of the saxophone reach ever higher and higher levels of admiration and respect. In the performance of both concert music and jazz, the saxophone has become a vital and significant force in the musical world of the twenty first century. It is my hope and desire to have this web page serve as a vehicle for an on-going dissemination and discussion of critical issues concerning the saxophone, for bringing about an awareness of the saxophone program at Northwestern University and for providing a means of communication between all of my present and former students. Many of these students have become and remain active in the saxophone world. Many others have gone beyond their love for making music into other meaningful and rewarding careers in life. In any case you all share a fellowship and camaraderie with NU and your saxo classmates. Please use this website to identify how you are doing, where you are and where your collegiate education has taken you. To all of you former students and other friends of the saxophone, let me tell you about the plans made at my retirement Celebration for the commissioning of a new Concerto for Saxophone and Orchestra by Augusta Read Thomas. Please take a minute to look over the new Hemke Legacy tab to learn more about this very exciting project and in the future, other pedagogy and performance projects.